Slow cooking in an oven as opposed to a slow cooker involves roasting at a lower temperature for a longer period of time. It offers the advantage of tenderizing leaner and tougher cuts of meat by minimizing the water loss that comes from cooking at higher temperatures. Use a Dutch oven or a roasting pan. The key is to allow the meat to cook gradually. Slow cooking is more appropriate for beef, pork and lamb than it is for boneless poultry, though thighs and leg pieces work well with this method. Preheat the oven to 200 degrees Fahrenheit. While it’s warming, prepare the meat or poultry. Coat it with any seasoning rub you prefer, then heat oil in a frying pan on the stove top. Brown the meat or chicken pieces on all sides and transfer them to a roasting pan or Dutch oven. If you’re cooking beef, lamb or pork, insert a meat thermometer into the thickest part of the roast. Place the roasting pan or Dutch oven in the oven. Estimate the cooking time at approximately twice the time the meat or poultry would cook at 350 to 375 degrees Fahrenheit. If you’re cooking meat, depending on the size of the cut, this could be as long as six to eight hours. Check the internal temperature of the roast as it nears its completion time. Beef, lamb or pork should register between 125 and 130 degrees Fahrenheit for rare, between 130 and 140 degrees for medium rare and about 140 to 145 degrees for medium. Cook poultry to an internal temperature of about 165 degrees Fahrenheit. Depending on how you want the roast done, increase the oven’s temperature to 500 degrees about 15 minutes before it reaches its final temperature. Roast it at the higher temperature for another 10 minutes for a browned and crunchier crust. Remove the roast or poultry from the oven. 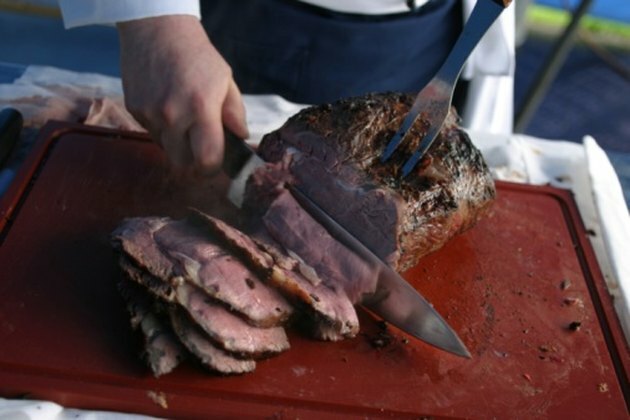 If you've cooked a roast, let it rest for 15 to 30 minutes before slicing and serving it. Slow cooking also creates a more even tone of doneness. The meat won’t be well-done near the surface, but rare or medium-rare at the center. At higher temperatures, the outside layer cooks first. By the time the center of the roast begins cooking, the outside edges will be overcooked. Slow cooking allows all parts of the roast to cook at an equal rate.